Some of the UFO observations and ufology news in May 2010 are listed on this page. Please note that these are not studies, but second hand observation reports, although mostly obtained from reliable and well known sources. 05.30.2010 Another U-K UFO that looks like a Chinese lantern. 05.23.2010 "Blame tsunamis on ET" conference in France. 05.18.2010 Newspaper talks of "UFO fall" in the Jura, France. 05.16.2010 "Expert" says Voyager 2 probe was "hijacked by aliens". 05.15.2010 Another "glowing light", in Potters Bar, U-K.
05.13.2010 Non-UFO said to have caused "alien invasion fear" in New Jersey, USA. 05.11.2010 Hovering black globe, Florida, USA. 05.10.2010 "Strange light" in New Jersey, USA. 05.02.2010 RAF man and his wife see UFO above Inverness, Scotland. Another U-K UFO that looks like a Chinese lantern. According to The Guardian, 23-year-old finance worker, former pilot and aircraft recognition teacher David Crook, of Cherston Road in Loughton, and his girlfriend saw a "mysterious orange ball" flying in the skies above Buckhurst Hill just before 11pm on May 30, 2010. People suggested the district's proximity to Stansted Airport could be to blame, others have theorised that the orange balls are Chinese lanterns, but Mr Crooks believes it wasn't a Chinese lantern as it was "absolutely huge" - no angular size is given but it couldn't have been huge as the witness believed it was about 5.000 feet up - and it wasn't particularly windy either - though no particularly strong winds are required for Chinese lanterns to move. His description totally fits a Chinese lantern: "It was a fairly big orange ball. It looked like a large ball of fire moving steadily at a good speed and it made no noise. It was very close to us [at 5.000 feet?] so it couldn't have been been an aircraft or helicopter." Mr Crooks says he doesn't "believe in UFOs and aliens" but believes it was "Perhaps it might be some new form of technology that's being tested that we don't know about." "Blame tsunamis on ET" conference in France. "70 % of the Americans saw a UFO", that "more than five million individuals would have been abducted by ET and submitted to experiments and that at each conference, there would be always at least one abducted person among the public", these people being abducted by "Especially the N, i.e. Aryan, tall nordics with blue eyes." We also learn that in "1933, Hitler would have had contacts with ET in order to build flying saucers to control the world", that in "1954, the treaty of Gréada (exchange of technologies would have taken place, the Americans would have given their agreement in order to exchange humans for experiments", and that " all the earthly disasters (volcanic tsunamis, eruptions, earthquakes) would be the deed of the aliens." Of course "the police officers, researchers, doctors, UN hide the truth" and "ET have the remote control of the brains with the only aim of making slaves of the humans." But fortunately it appears that one can escape them with "Personocratia", (I'm not making this up up!) "It would be about any person who would remember that she is a Diesse, name of the supreme being inherent all that exists. It is at the same time the creative spirit and the matter created. Any person would be Diesse, whether knowingly or not." And "various training courses on the Diessity of Personocratia" were proposed. Newspaper talks of "UFO fall" in the Jura, France. Le Progrès, a newspaper of the Jura, reports on May 19, 2010 that a camper in Clairvaux les Lacs "reportedly witnessed the fall of a UFO in Lake Vouglans", and that the SATER plan - air-land rescue operation - was started on a purely conservatory basis by the Prefecture of the Jura, yesterday. "A vast search operation was deployed in a broad perimeter, on five communities around Lake Vouglans", nothing was not found, the SATER search was ended in the end of the afternoon and of research continue but with reduced means. Le Progès says that the authorities are not certain that an incident really occurred and that only one witness came forward. Did he saw the fall of a Chinese lantern? We first learn that for the witness, the "UFO" would have been according to him... "an aircraft or ultralight aircraft." Then, a resident of Châtillon-sur-Chalaronne in the department of the Ain, stated following the previous publiation to have observed "another scene little after midnight, while she was at the sides of her companion and his mother." The description is: "We saw a kind of orange and luminous ball in the sky, which changed shape and became sometimes increasing luminous, but without moving. It was seen, then not seen anymore, she explains." "Expert" says Voyager 2 probe was "hijacked by aliens". The new sensation on the UFO websites and even some newspapers is a claim that an "expert" said the NASA probe Voyager 2 was "hijacked by aliens". Voyager 2 was launched by NASA in 1977, and contained a disc with music and greetings in case intelligent extraterrestrials found it. "Alien expert Hartwig Hausdorf (54, 'UFOs – They Are Still Flying') said: 'It seems almost as if someone had reprogrammed or hijacked the probe – thus perhaps we do not yet know the whole truth...'"
The wild speculation by German UFO books author Hartwig Hausdorf made a buzz on the net since. It is true that Voyager 2, who is now very far away with its radio signal needing 13 hours to reach Earth, has been experiencing communication problems, but to call this "alien hijacking" is only wishful thing. Another "glowing light", in Potters Bar, U-K..
Welyyn Hatfield Time 24 reports on Monday, 17 May, 2010, that one Gill Knights reported a sighting dated May 15, 2010, at 09:30 p.m., to www.uk-ufo.co.uk, telling that several people witnessed a "ball of fire" in Potters Bar, U-K.
She said it was "a very bright red light shining behind the branches of a tree". Intrigued, she ran out further and saw "an orange/red sphere shape travelling across the sky. It looked like a ball of fire. We tried to get pictures but we couldn’t locate the object on the viewfinder." She ran in to the house and up to her son's bedroom, where he was with five of his friends and they all saw it. They watched it a little longer and it changed into a white glow. This looks, again, like another Chinese lantern. Non-UFO said to have caused "alien invasion fear" in New Jersey, USA. An object said to be a "strange, silvery sausage" drifted over Sommerville, New Jersey on May 13, 2010, apparently "prompting fears that a UFO might be menacing the Garden State." According to the New Jersey Star Ledger newspaper, Somerville Police Lt. Donna Young said authorities were not sure what the object was, but said it caused no problems other than tying up police phone lines shortly before noon. Hovering black globe, Florida, USA. A Florida UFO enthusiast searching the night sky with binoculars said he spotted a hovering black orb about 3 feet across and estimated at between 1,000 to 2,000 feet off of the ground above Lutz at 1:55 p.m. on May 11, 2010, according to testimony from the Mutual UFO Network (MUFON) witness reporting database. 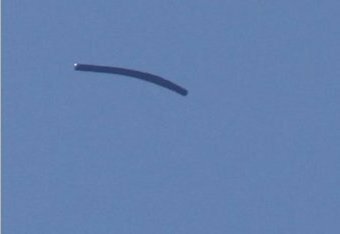 After about 5 minutes, the object, which of course could have been a balloon, began moving west, stopped occassionally, and then seemed to disappear. "Strange light" in New Jersey, USA. Someone said he and a friend saw a "strange light" in the sky near 9 p.m. on May 10, 2010, that was very bright about three miles from their location and heading toward the Delaware Water Gap, New Jersey, USA, according to testimony from the Mutual UFO Network (MUFON) witness reporting database. One witness attempted to signal the object, but there was no response. "It at first seemed to be hovering over one point but we found the object to be maneuvering away from our position, as it eventually disappeared over the horizon," the reporting witness stated. RAF man and his wife see UFO above Inverness, Scotland. Highland News says the sighting of "an orange fireball" in the sky near Inverness, Scotland, on May 2, 2010, was reported by an RAF serviceman and his wife, Karl and Heather King. They said they were in their garden when they spotted the unusual phenomenon at about 10:30 p.m. in the sky from their New Elgin home in Moray. Mrs King said they saw what looked like an orange fireball and her husband reckoned it was above Inverness. "It was an orange flame and was hovering. It came towards us then the light died out and it became a black sphere and started to spin towards the ground but we lost it in the cloud. It was really big and there was no noise." She said they couldn't believe what they were seeing and Karl went inside to get a telescope and they observed the light for a couple of minutes before it finally disappeared. Mr King said: "We went online to see if there were any meteor showers and there were none that we could find. But we came across the Highland News stories and the description was very similar to what we saw. "As an RAF man I'm an aviation enthusiast. I know planes when I see them but I have never seen anything like this before. My thoughts were at that height it must have been in the Inverness area. "UFOs are not something I have really thought about but this was definitely unexplained and it was definitely not a Chinese lantern." Mr King even considered the possibility that it could have been debris from a space shuttle. "But I don't think a space shuttle separation could be seen in this part of the world and if something like that was going to happen we would have heard about it. I couldn't put my finger on what it was, but it wasn't an aircraft." Mrs King added: "I would be amazed if we were the only people who saw it."